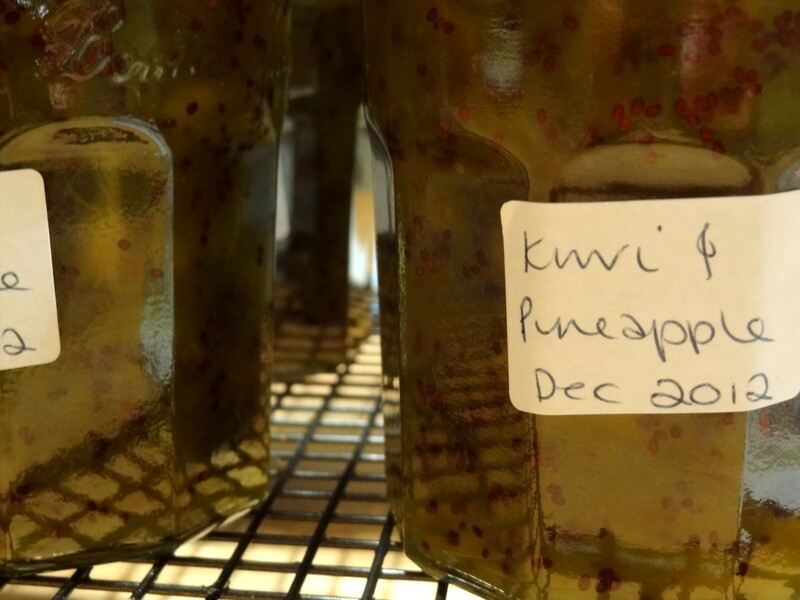 We had a good crop of cocktail kiwis this year – too many just to eat so I decided to make some kiwi & pineapple jam. Makes around 7 jars : this is a good thing for me as we still have several of the 112 jars of fig & walnut left from 2 years ago which the children are now refusing to eat. 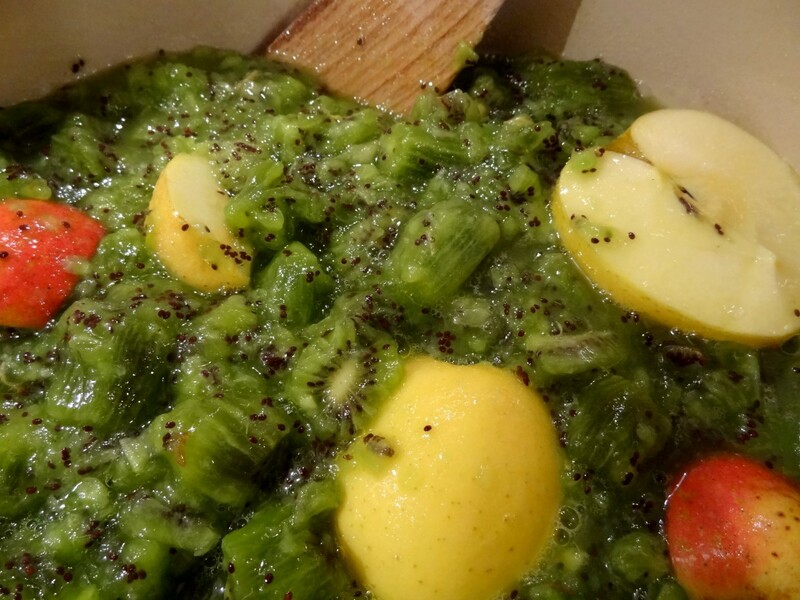 In a large saucepan, combine mashed kiwi, pineapple juice, lemon juice and apples. Bring to the boil and add the sugar; stir to dissolve, reduce heat and simmer for 30 minutes. Remove apples, pour into hot, sterilised jars and seal. 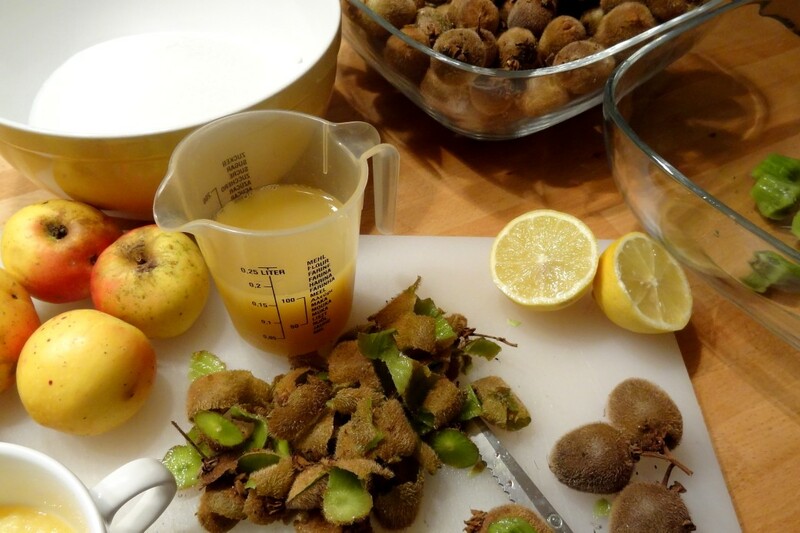 The recipe says 24 kiwis & 10 mins preparation time. If only. A quick mathematical calculation deemed that I’d need around 2 kilos of cocktail kiwis which meant I had to peel 3 kilos…this alone took me 1 hour & 15 mins. Better to use ordinary ones! I decided to add an extra apple ( for the pectin) & give it an extra 5 mins as I thought this may be a runny jam & I prefer mine a bit thicker. It was the extra 5 mins which did it – I burnt the jam. Simmer all ingredients for 30 mins - I gave it an extra 5 minutes just to be sure! 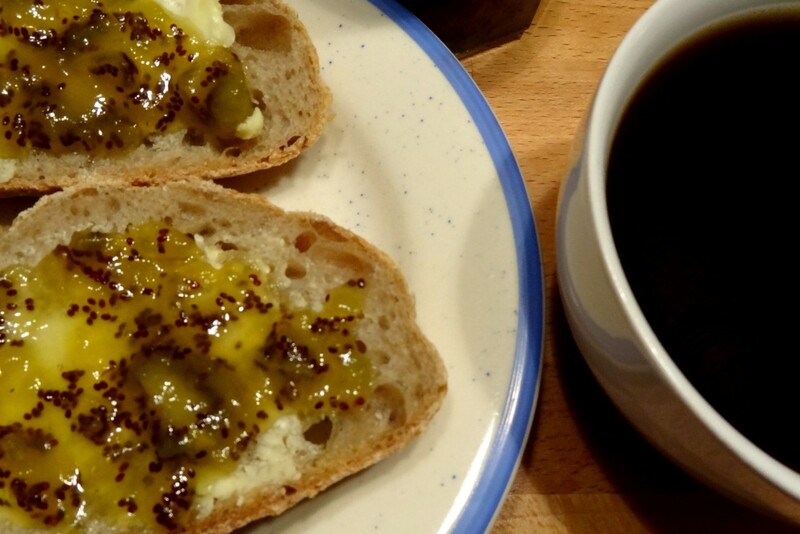 Well, it wasn’t a jam Disaahster – it was a perfectly decent batch of kiwi & pineapple jam with just the slightest hint of smokiness running through it! I had some this morning on organic bread freshly delivered from Pain de Jaya – Delicious!! Edit – Amar has just had some and has declared it to be too sharp to be a good jam – personally I like it like that & suspect it’s the hint of burnt that’s swaying his opinion. But in this household he is the authority on all things food so maybe a bit more sugar or a bit less lemon may improve things!! I do like the sound of that recipe, Elena. It’s Amar’s opinion that swung it – I like a bit of sharp in my jam and find most peoples’ recipes too sweet. 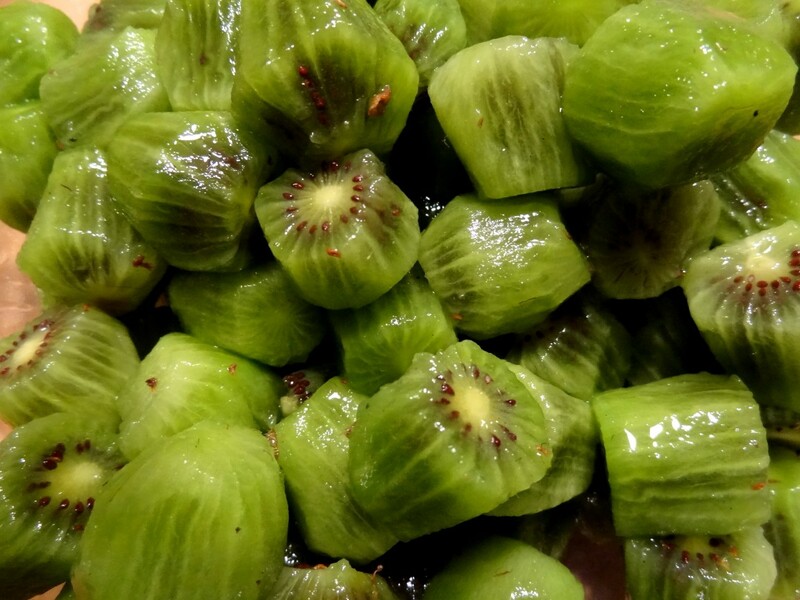 I usually just scoop out kiwi flesh with a teaspoon, like a hard boiled egg – find that much quicker, though it might not work with cocktail kiwis (I’m not sure I know what they are!). We don’t grow them but others here do and they’re just coming into season now here, so in between winter guests and then redecorating our kitchen (sigh) I think I’ll have a go. 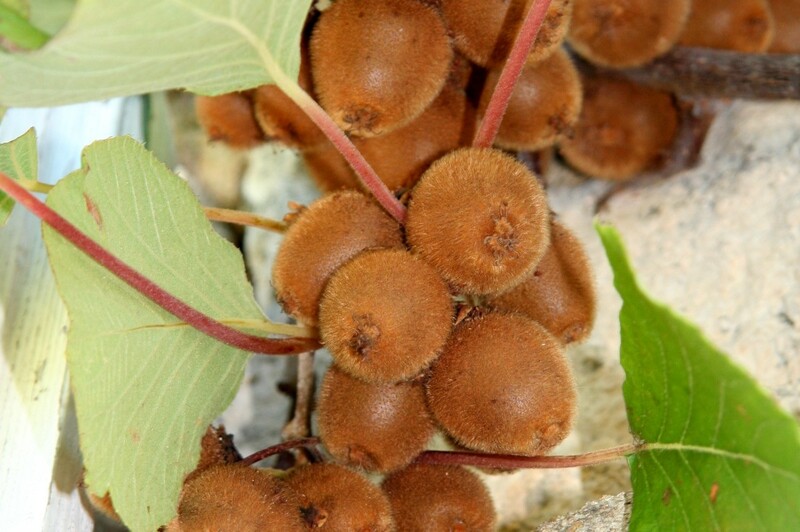 Cocktail kiwis are just mini versions of a normal size kiwi – I’ve heard that you can just eat them whole as they are without peeling them but they’re just as hairy as their bigger cousins and it’s not nice!! We planted ours by accident & Amar has now swapped a couple of the plants for the big variety which have just started giving fruit this year so that should be a lot easier! I’m annoyed I burnt the bottom of the pan as I do think it would have been really good – will maybe try again with the 8 or so kilos we have left over!! Good luck with the kitchen!! I agree with Kalba I prefer my jam tangy rather than sweet. Nothing better than good bread, butter and jam. mmm that’s very Scottish , a ‘jam piece’. Or even more Scottish …a jeely piece! When we were young my uncle & auntie used to give us a miner’s piece which was bread,butter,blackcurrant jam & cheddar cheese. Sounds a bit suspect but it was actually ok!! never tried making jam with those two fruits. Have made strawberry, apricot, figs and peach jam (not all in the same cooking pot)…. recipes in our blog.